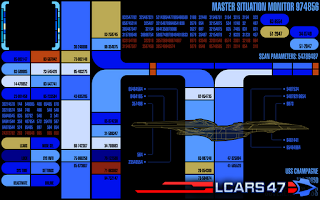 I've just finished the Champaign update for LCARS 47 (versions 5.2+). It won't affect the LCARS apps themselves, until version 6 is finished, but you will see the changes in the StartApp, which now includes the ability to edit the config files. On a semi related note, the ship class plugin project is coming along nicely. Once LCARS 6 is released, you will be able to download any of the ship class plugins (only 1 ship class will work at any given time).